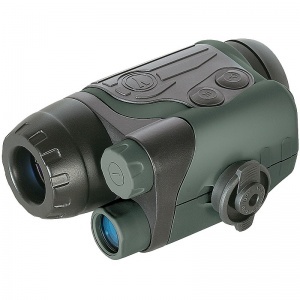 The compact and lightweight NVMT Spartan 2x24 monocular offers 2.0x image magnification and a 30º field of view. The Yukon NVMT (Night Vision Multi Task) Spartan range is the most ergonomically designed, aesthetically pleasing, well featured and highest performing Gen 1 night vision monocular series on the market today. With smooth and intuitive focusable objective and ocular lenses there is also an integral slot built-in to the bodyshell to retain the lens cap while the monocular is in use. Operational status LED illuminate green for the image intensifier tube and red for the IR illuminator, helping to preserve battery life and serving to alert the user should the device accidently be switched or left on. With the benefit of twin Whitworth threads built-in for secure mounting to tripods and as attachment points for the numerous accessory options available to enhance performance and function, each unit is individually serial numbered and comes supplied with a secure detachable wrist strap and soft carry case with convenient belt loop.